Ken Williams was one of two African American employees at Polaroid who formed the Polaroid Revolutionary Workers Movement (PRWM) in 1970. This photo shows Williams with a “Boycott Polaroid” poster. The PRWM advocated a boycott of the company when they discovered that the company's products were being used in passbooks in South Africa. 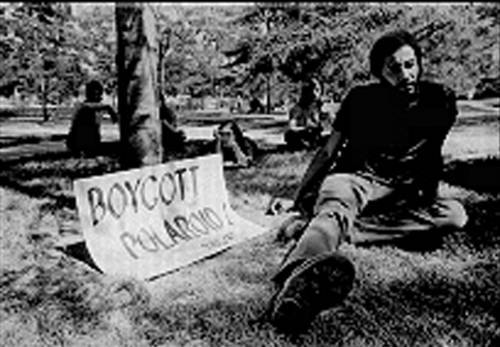 Williams and two other employees were fired by Polaroid in 1971. This photo was digitized by Clarity Films. The photo may have been taken in Cambridge, Massachusetts.